How famous can you get before you get voted off the island of the music fanatic? Jay-Z, you are this challenge. I’m not going to get into the kind of carbon dating debates that often preoccupy music fans, but I’ve liked Jay-Z for a long time. When he says (often) that he is the “best rapper alive”– well, I agree. The challenge is that, in the time since I’ve liked him, he’s also become (and stayed) the most famous rapper alive. There’s little music cred to be gained in proclaiming one’s love for Jay-Z… except, maybe, defiant cred in that you’re cool with putting your favoritism chips down a thoroughly un-clever choice. Sometimes I question my choice. Hell, I own a t-shirt that says “I listen to bands that don’t even exist yet” (a great t-shirt, yes?). You can understand my dilemma. It’s borderline musical sacrilege to compare anything to the radically-innovative combination that created “Walk This Way.” That most unlikely of combinations clearly changed the trajectory of pop music for all to follow. But, when Jay and Rick Rubin created this song, their combination of bravura braggadocio and meaty guitar licks… well, it came close. The song is powerful, the video stunning, and the new takes on it awesome. I’ll highlight each in turn because, well, it’s this kind of stuff that credential my *favorite band*– however famous he may be. 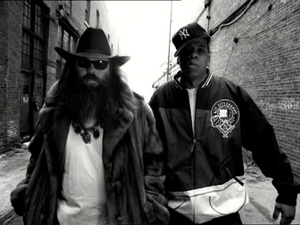 This entry was posted in Music + Moments and tagged 30 days of music, Innovation, Jay-Z, Rick Rubin, Run DMC. Bookmark the permalink.